Dufourspitze named after Guillaume-Henri Dufour—a Swiss engineer and co-founder of the Red Cross, by the Swiss Federal Council on January 28, 1863, (in German, lit. Dufour Peak) , Pointe Dufour (in French), Punta Dufour (in Italian), or Monte Rosa is the second highest mountain in the Alps and western Europe and the highest of Switzerland, at a height of approximately 4,634 m (15,203 ft). The mountain, which is part of the Pennine Alps in southern Valais, is the culminating point of the Monte Rosa Massif, consisting of several summits over 4,500 metres lying on the border between Italy and Switzerland. 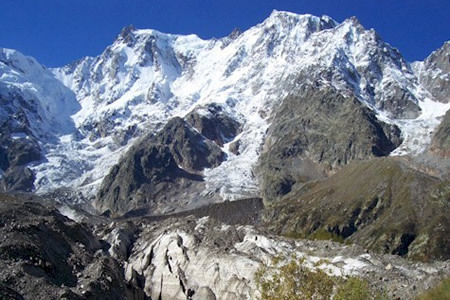 While the eastern side forms the tallest wall in the Alps, the western side of the pink mountain gives birth to the Gorner Glacier, the second largest glacier in the Alps. Other high summits of the Swiss Alps, including the Matterhorn, are located within a few tens of kilometres away. The base of this mountain gives birth to the 4 rivers which flow in four different directions through the whole of Europe. And no mountain has its base at so great a height as this, which lifts itself above almost all the clouds; and snow seldom falls there, but only hail in the summer, when the clouds are highest. And this hail lies there, so that if it were not for the absorption of the rising and falling clouds, which does not happen more than twice in an age, an enormous mass of ice would be piled up there by the layers of hail, and in the middle of July I found it very considerable; and I saw the sky above me quite dark, and the sun as it fell on the mountain was far brighter here than in the plains below, because a smaller extent of atmosphere lay between the summit of the mountain and the sun. In 1778 a group of seven people from Gressoney reached the 4,178 m – high Entdeckungsfels (German: Rock of Discovery) above the Lisjoch; it was the first recorded exploration of the upper Grenz Glacier, located on the west slopes. An attempt was made from Macugna by the Count Morozza della Rocca in 1787. He reached the place of the actual Marinelli hut on the east face, but still 1,500 m below the summit. The route on the east face will be opened only in 1873. 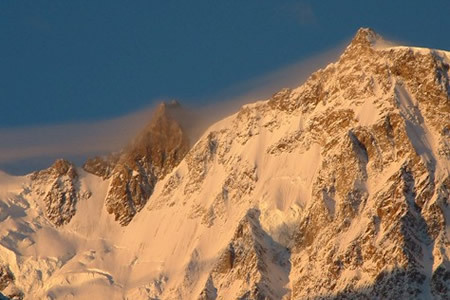 In 1789 Horace-Bénédict de Saussure climbed the Pizzo Bianco, a summit east of the pink mountain, in order to study its eastern wall and to try to find a way to the top, but without success. A major ascent was made in the year 1820 by Joseph Zumstein and party on a lower summit, the Zumsteinspitze. During the expedition they thought they had climbed the true highest peak, but when they reached the summit they found out it was only a subpeak of the massif. The first approaches to the summit were made from the west slopes. The Silbersattel was reached in 1847 by V. Puisieux, E. Ordinaire and guides J. Brantschen, J. Moser, M. and J. Zumtaugwald.On September 1854, the brothers Christopher, Edmund and James G. Smyth with guides Ulrich Lauener climbed a 4,630 m high minor summit located 100 m east of the Dufourspitze, now called Ostspitze. The brothers Smith were convinced they had climbed the highest peak because at the time it was unclear where exactly was the highest point. The first complete ascent was made from Zermatt on August 1, 1855 by John Birkbeck, Charles Hudson, Christopher Smyth, James G. Smyth, Edward Stephenson with the guides Matthäus Zumtaugwald and Johannes Zumtaugwald and Ulrich Lauener. They followed the already opened route to the Ostspitze by the Silbersattel. On the summits, instead of turning back on the same way, they decided to continue on the unexplored western ridge and thus passed the thrue summit before going down to Zermatt. One of the climbers, Charles Hudson, will die 10 years later during the first ascent of the Matterhorn. John Tyndall in addition to be a prominent physicist, was an accomplished mountaineer. According to his account (Glaciers of the Alps), in 1858 he made the first solo ascent. Tyndall had already summited the Dufourspitze in a guided group one week before but he made an unplanned second summit solo on 17 August.